Mark Hawkins (MBA ’86) addresses graduates during the 2018 UCCS Fall Commencement. 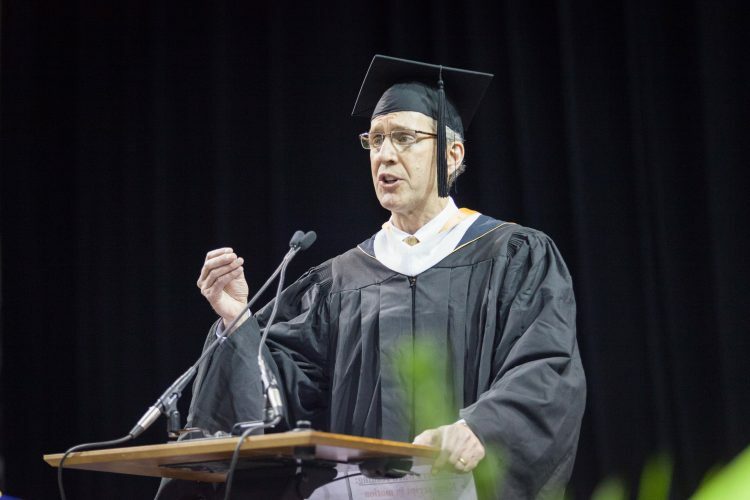 Mark Hawkins told the UCCS graduates to embrace the challenge of changing the world as he delivered the keynote address to more than 550 students and their families at the fall commencement ceremonies Dec. 14 at the Broadmoor World Arena. “You’re the first generation of leaders who will put social impact at the center of everything you do, every business you create, technology you invent, vision you have. You look at our world and believe it can and should do better. You are impatient to get to work to solve the challenges that face us, impatient with anything that might stand in your way. Hawkins, a 1986 UCCS MBA graduate, thanked the educators, administrators and counselors who motivated him through night school while he worked for Hewlett-Packard. Today, he is the president and chief financial officer of Salesforce, one of the world’s leading software companies. There is no finish line when it comes to learning. Do the right thing, even when nobody’s watching. Real leaders don’t go it alone. Hawkins spoke to the graduates as the 10th Distinguished Alumni Award recipient. UCCS conferred degrees on more than 1,000 students who completed their academic programs in the summer and fall semesters, and more than 550 participated in the commencement ceremony.